The ship was built in Gdansk (Poland) in 1985; commissioned in 1986. Initially, it was named BDK-110. On April 10, 2009 cable routing ignited at machinery hold. 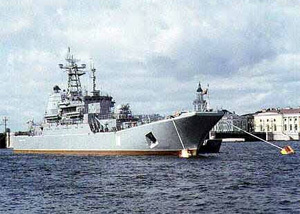 The ship was under scheduled repair at Yantar shipyard. The fire moved to cooling section; about 5 square meters scorched. The fire was extinguished by 12 fire trucks and 42 firefighters. In April 2009 during mail checking, a birthday card was found with 9 pieces of pressed marijuana stuck inside. A criminal case was initiated.